" />Ok, now this one is for me. American white oak again, 6 foot 1" long with a simple leather handle wrap and bone overlays on the tips and finished with several coats of danish oil. I left the wood natural rather than stain it. It pulls 50 Ib. Close up of the tip, I used regular epoxy and clamped it overnight before shaping the tips. Thought bone would be a nice change from the horn or antler you usually see. have you got a full draw photo? I've got a photo of it at full draw on the tiller though it's on my camera at work and i'm not in untill Monday! I'll post it up then. 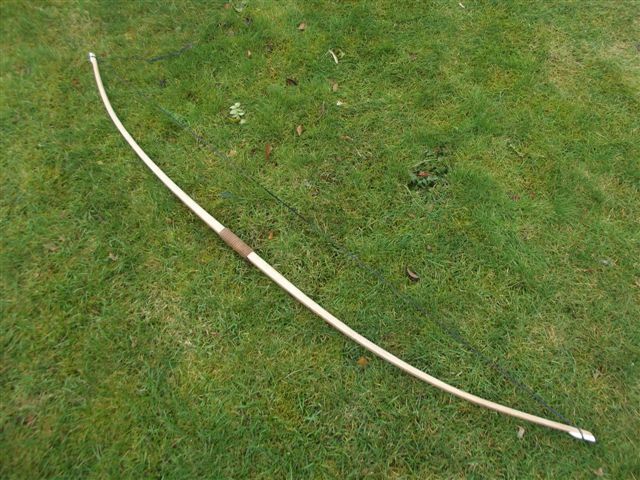 This guy suggests prehistoric people fired bows very differently to preset day archers. Holy crap! He's got a point though. 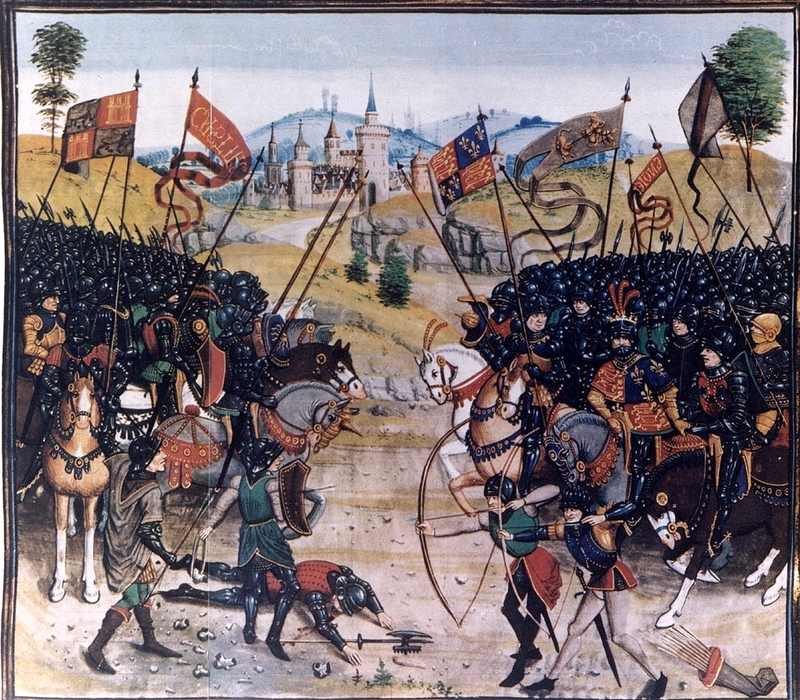 The video shows a medieval image of the arrows being rested on the finger side, however a quick scan of Jean Froissart doesn't back this up. 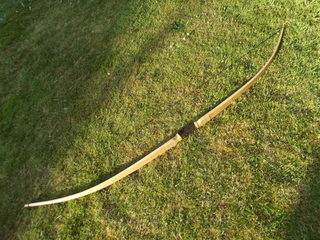 This is the longbow at full stretch (before the tips where added), in fact one further so at 28" or so. 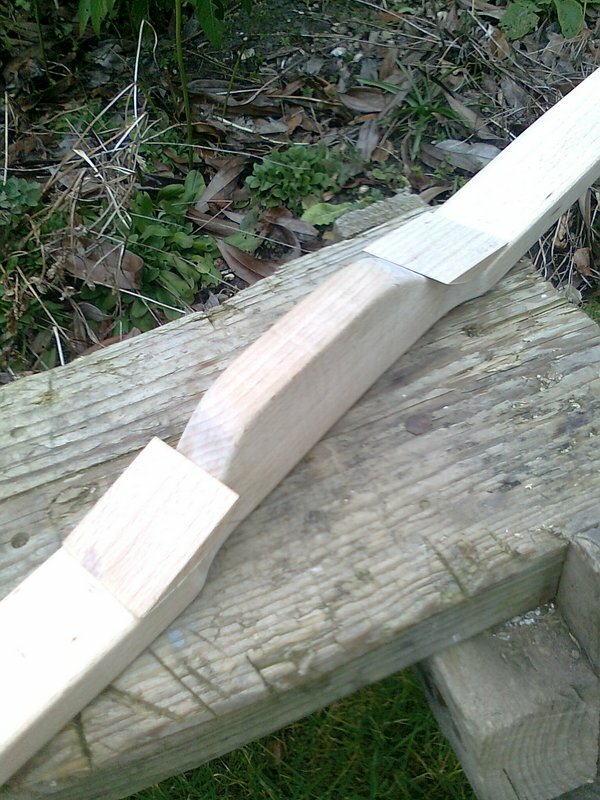 I had a hinge that refused to budge much and after a while I was a little worried to take any more wood away so the resulting bow is very slightly whip-ended. This was made from the piece of wood in the board of white oak next to the last one, this one had slightly more wibble to the grain but wasn't that bad. Maybe that was the cause of the fight in the tillering process. 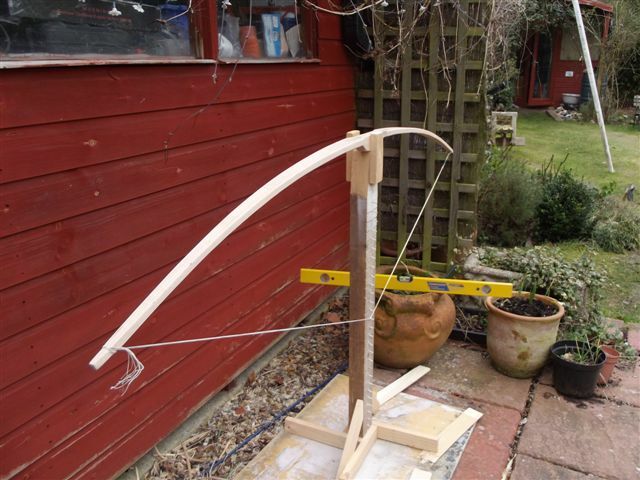 The amount of wood I had to take off resulted in a slightly lighter poundage of pull than the last bow but at 50Ib for this one it makes it easier to draw. Anyway this one's my wife now, dave! More bows, sorry! 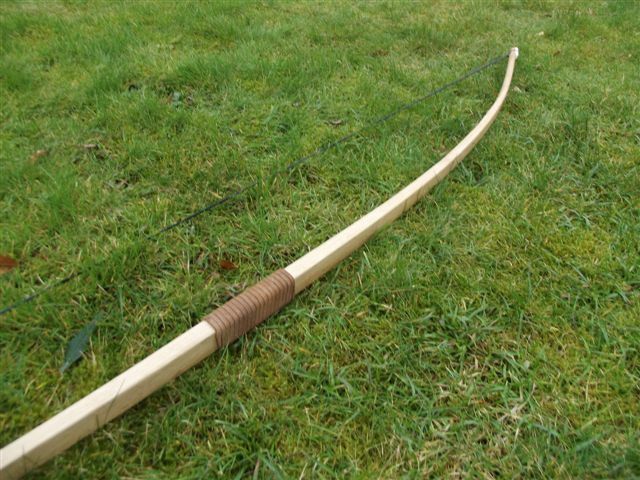 This is the Beechwood bow that I'm fighting with at the mo, it's bending way too much either side of the handle (Native saw that one coming) and has chrysaled slightly on the belly right near the handle. I'm following a plan which is rubbish and is simply a bad design, the handle is too short and abrupt at the fades, hence the trouble. So this is my last ditch hope, two "fillets" that will be epoxied on over the chrysal and blended in with the rest of the handle giving the fades it should have had in the first place! I guess i'll have to bind over this with some epoxy soaked linen and hope it doesn't pop off. shame you couldnt use contrasting wood and make it part of the design maybe shaped in some way for hand stops. I did consider it, but it's going to be covered up by the binding. I guess I'm just adding back on the wood I shouldn't have removed! Still it's a new bow design to me and I have learnt, the Grrr way! These two pieces will all be carved back into the handle when its glued on, they're just little blocks resting on the handle in the pic.
" />Well I got this bow shooting and it seemed to fight me all the way. 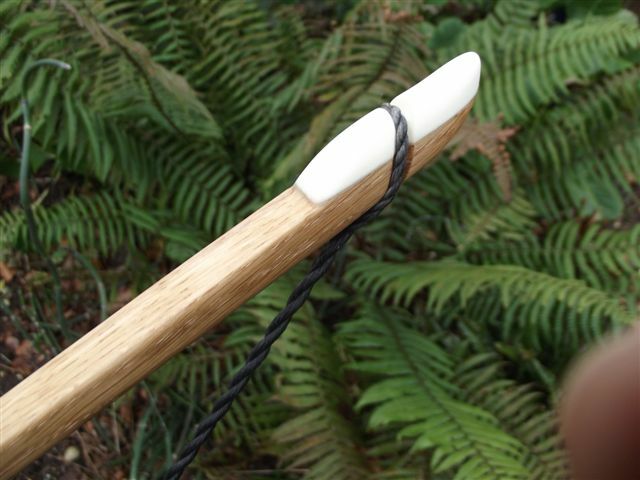 I just bound the handle with hemp string and wood glue and then was able to finish tillering without anything popping off. It pulls a nice feeling 30 pounds though already it's showing some small chrysals on the belly. I don't expect this one to last that long. 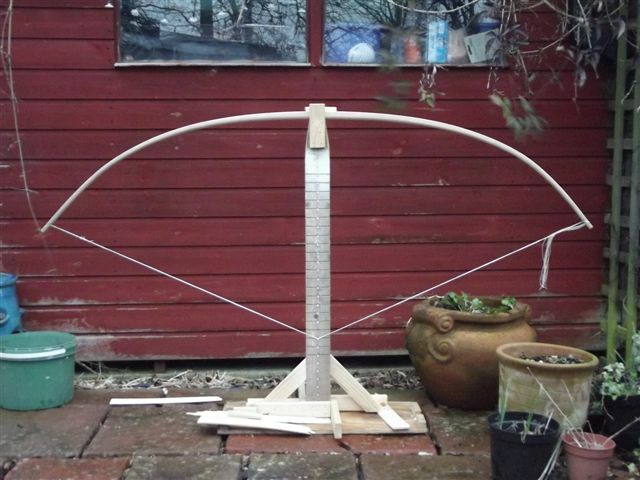 Conclusions: Don't make a bow out of Beech wood even if it's European Beech, and make sure your plan is sound!